With Oriental poppies in your garden, you're guaranteed to have a stunning display of bright blooms every spring. Oriental poppies, (Papaver orientale), are tall perennial plants that will grow to heights of 3 feet, making them ideal for the back of a flower bed, where they can provide a splashy backdrop for other colorful plants. Oriental poppies are a good choice for the busy or novice gardener, and once planted, the poppies prefer to be left alone and are fussy about being moved. As a result, Oriental poppies should be divided only when necessary, usually every four to six years. Divide Oriental poppies in late August or September when the poppies begin to regrow. Prepare a sunny, well-drained planting spot for the divisions ahead of time. Oriental poppies need at least eight hours of bright sunlight each day to produce the best blooms. It's a good idea to plant Oriental poppies in the back of the flower bed so other plants will hide the foliage of the Oriental poppy when it begins to wither and turn yellow. Cultivate the soil with a shovel or tiller, and work in 2 to 3 inches of compost. Water the Oriental poppies the day before you intend to divide the plant. Moist soil will make digging the clumps easier, and will help the poppies to withstand the stress of transplantation. Dig the clump of Oriental poppies with a garden fork. Start digging about 6 inches from the plant so you don't poke the fork into the roots. Work your way around the circumference of the Oriental poppy plant, then lift the plant carefully from the ground. 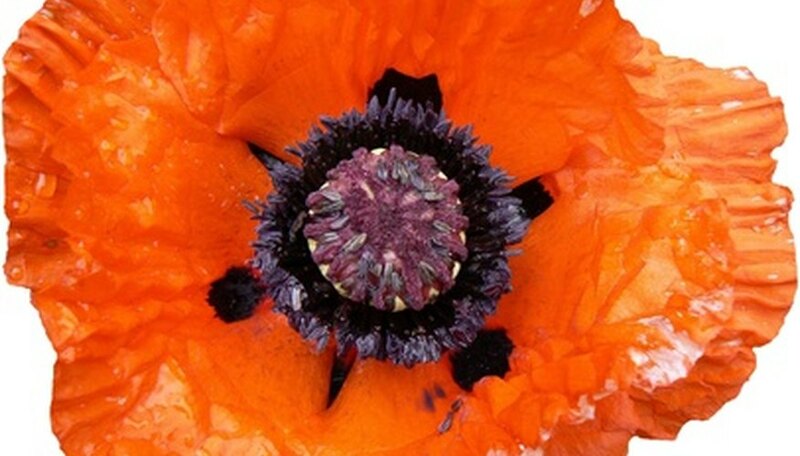 Divide the Oriental poppy clumps into smaller sections with your hands or a shovel. Be sure each division is large enough to have a healthy root system. An Oriental poppy clump that would fit in a large coffee can is a good starting size. Discard any sections that are dead or dying, as well as any sections with soft, brown roots. Plant the divided Oriental poppies into their new home as soon as possible. Don't plant the poppies any deeper than they were previously. Water the Oriental poppies immediately, then give them about an inch of water every week until they bud. Unlike most blooming plants, Oriental poppies won't produce more blooms if you clip off spent blossoms. For that reason, you can leave the blooms on the plant so you an enjoy the appearance of the seed pods.